Anyway, you know that saying, “People plan and God laughs.”? Well, I’m pretty sure He was bent over in FULL guffaw, whilst hands on His own knees so as not to fall over at my paltry attempt to “make the most” of my midwestern summer. Many a Chicago runner eagerly await the first and then final signs that Spring/Summer is/are here. We buy new shoes, fresh workout wear, dig the sport sunglasses out, relish Daylight Savings, maybe download a new “track my route”-type app or get a new GPS. 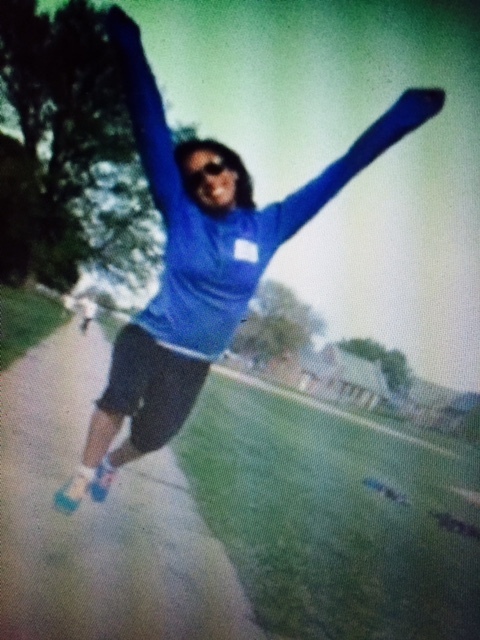 Yet, the real inner-mojo comes from plotting those runs: Fartleks, sprints, two-a-days (my personal favorate), easy-pace and, of course, reconnecting with our running group (for those of us that bailed in the cold and dark that is Jan-April!). June 2-17 – No running; visit to sports med Dr.; cross training both indoor and outdoor cycling; 2x/wk physical therapy; being a “good girl”. 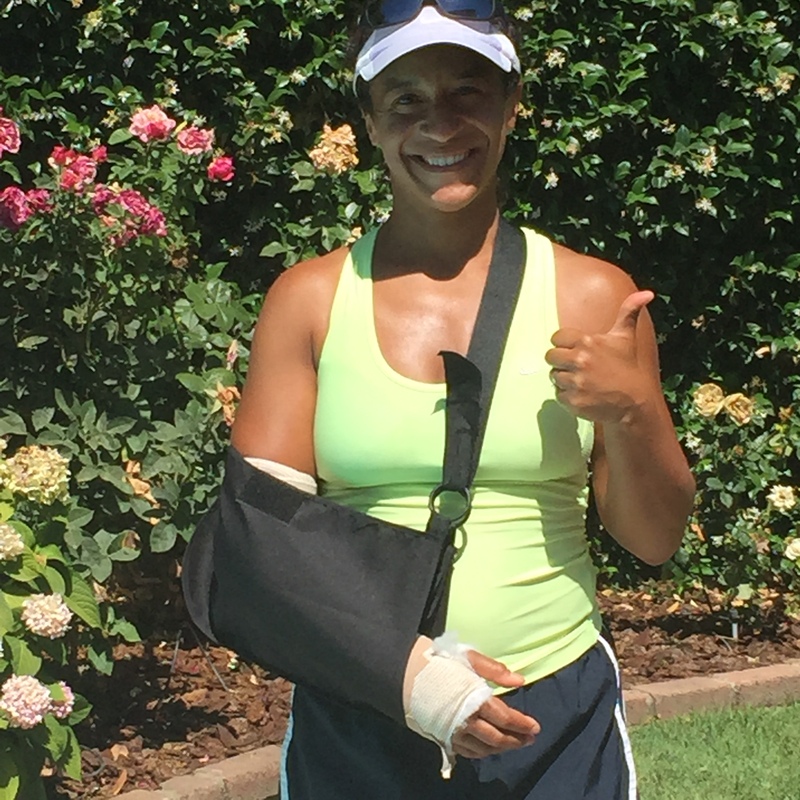 June 24 – hubby and I go with the SIL to “Adults Only”-night at a roller rink and I break my wrist 38 minutes in; trip to ER w/discharge referral for trauma surgeon to set the wrist (dominant hand) PERFECTLY. Sometimes you just need an “altitude” adjustment…. Posted by admin on Jul 23, 2014 in Wellness | Comments Off on Sometimes you just need an “altitude” adjustment…. And (I know you should not start sentences this way but this is a blog so…) while I know one cannot out run the stress of work, life, family, relationships, etc., I know that sometimes you need to press “pause” or hit the “reset” button. The benefits to one personally, and therefore those around you, when you take the time to restore, rejuvenate, and replenish yourself are oft not sought out in the names of guilt, indulgence, over-booked, and probably worst – selfish. And 🙂 while this is not something I struggle with personally, I have consulted and worked with more women who seem determined to leave themselves depleted in the name selflessness. When did it become an admirable quality to give so much that there is nothing left of or for yourself?? As I was running this morning (a l’il birthday gift to myself), I wondered if this was a generational thing. Did my mom take time to take care of herself so she was a better person, wife, mother, daughter, sister, and friend? You betcha! I had to think about it a bit but then came back the memories of weekends “away” (’cause I learned they were only at the Holiday Inn in Milwaukee) with my dad, or Bible study retreats to one of the homes of her friends in Michigan or Wisconsin. I will ask her but I am certain she fled without a backward glance at the stress she left behind AND that absence made her heart grow fonder and she stronger, her mind clearer, and her heart more peaceful. So (I know…), after having spent a week in the Rocky Mountains of Colorado co-coaching a fitness trip with my friend Kathy Kent, I realized just how much I needed this “altitude” adjustment. Personally, I was spent by the time the trip arrived. I was crabby, exhausted, shouty, and irritable – despite my daily workouts – which had also become less enjoyable. Professionally I felt a bit fragmented as in one weeks time I would pursue two separate passions which seemed to complement each other but were somehow not yet fitting together as well as I thought they should. Nutritionally I was feeling “blah” as the “joy of cooking” has always been a bit of a foreign experience to me that felt more like HTML code after starting a family meant pressure on me to cook both nutritious and yummy food. Spiritually, my relationship with God was starting to feel less authentic and natural and more “checklisty”. Fast-forward to now, after a week spent being intentionally active and nutritionally sound “at altitude”, rounded out by a few days in Denver with more amazing women at The Scoop with CAbi, and things are definitely still looking up! Whether on vacation, traveling for working, moving through the 9-to-5 grind, chauffeuring kids to camp/practice/lessons/sleepovers/etc, being intentional about “Fitting F.I.T.T. In”™ needs to take the lead more often than it does not. Whether it is for an “altitude adjustment” or not, learning how to establish and incorporate your health and fitness routine through the seasons of life can be a tremendous gift to yourself and those you care for. Not only will you be fit, healthy, and strong physically, but you may just find that this helps you to feel free to just BE. Jen Dixon is a personal trainer and fitness instructor who has worked in the fitness industry for over 29 years. She is certified through the National Strength and Conditioning Association (NSCA-CPT), HealthyMoms® Fitness - Master Trainer (Perinatal Fitness Instruction), and holds specialty training in Women's Health with Pelvicore®, Total Control® and Exercise After Cancer. For the past 15 years, Jen has been working with clients primarily in Chicago and on the North Shore, specializing in women's health and fitness. Over the course of the last 12 years, Jen has worked to expand her clients’ focus to family fitness and health. Jen is married and has 2 daughters, ages 13 and 16, and loves seeing the benefits of her work create a Fit, Healthy, and Strong family! YGG!F Partners for First Fitness Retreat!